Make sure to add inventory values into the Starting Inventory column of the inventory table for your products. If the inventory cells are blank, it will be the same as infinite or unlimited units. This means that units that are ordered will be tallied but not hit a limit (sell out) and prevent further orders from being placed. Presentations and orders can be set to either one, depending on which count you wish to deduct from. In the Presentation Settings, you will also have the option to Show/Hide Inventory units if you desire. The ordering mode for the presentation determines the ordering mode for the Order when written by the Buyer. When a Buyer writes an order from an AT-ONCE presentation, their order will automatically be set to AT-ONCE as well. 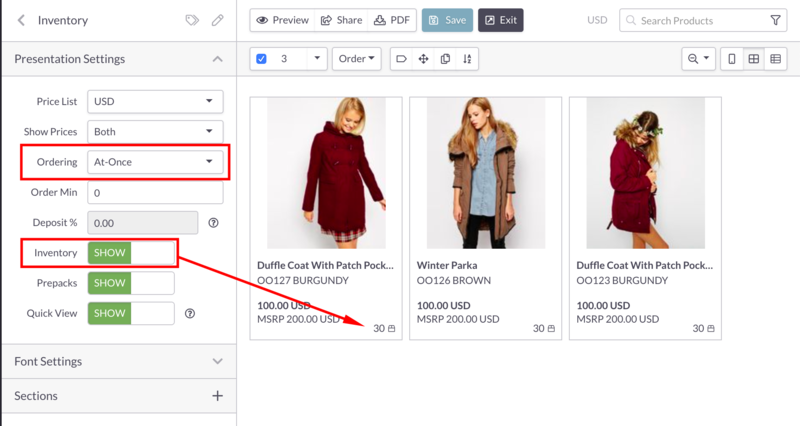 If you've toggled the switch to SHOW Inventory, Buyers will see the available units on the Presentation and in the size cells when writing their order.